The 2012 model year is just underway but there is already great anticipation for the new Ford Escape for 2013. The Escape, which is Ford’s compact crossover model, is ditching its boxier look for a sleeker, more modern look that is already on display in Europe in the form of the Ford Kuga. The Escape has been a huge hit for Ford since it debuted for the 2001 model year. Ford has sold nearly 2,000,000 Escape’s since then. The Escape offers utility, higher ground clearance, and all-wheel drive capability of an SUV in a fuel-efficient package. 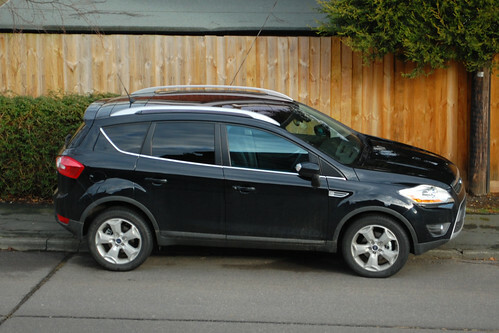 Ford publicly debuted the 2013 Escape at the November 2011 LA Auto Show. The model has alloy wheels, wraparound design tail lamps, and a trapezoidal lower grille. The model retains its 2.5-liter four-cylinder base engine but adds the new 1.6-liter EcoBoost four-cylinder engine that produces 173 horsepower. This new EcoBoost engine should be one of the most fuel-efficient offerings among compact crossovers and improve fuel economy in the model by about 20% highway compared to the 2011 model. Ford will have to also significantly increase the efficiency of the Escape Hybrid, for the model to continue to make sense to buyers. The 2013 Escape will also offer the 2.0-liter 237 horsepower EcoBoost four-cylinder turbocharged engine already found in the midsize 2012 Ford Explorer and Ford Edge. All 2013 Escape’s will come standard with a six speed automatic transmission, with an optional intelligent all-wheel drive system. The 2013 Escape will offer Ford’s newly revamped MyFord Touch infotainment system, a hands-free liftgate system, and active park assist. Despite having a more rounded design and a roofline that curves down, the 2013 Escape has more cargo room than the 2012 model. The model has 68.1 cubic feet of cargo room with the rear seats folded, which is comparable to several midsize SUVs such as the Jeep Grand Cherokee and Nissan Murano. Cargo room changes little from 2011 as the rear floor was lowered allowing for easier loading. However, this is less than compact competitors such as the Honda CR-V and Toyota RAV4 but larger than the Chevrolet Equinox and Nissan Rogue. The Escape’s sleek design gives the Escape a more aerodynamic stance. The 2013 Ford Escape will be released very early for a 2013 model with a planned sales debut in Spring 2012. The model is key for Ford as it hopes to retain its claim for best selling SUV. Do you like the styling of the 2013 Ford Escape?